I wrote a detailed report of my first experiences with the HVX200 camcorder titled “First Look: Panasonic AG-HVX200 DVCPro HD Camcorder, Part 1” (a more orderly and polished version of my previous posts on the camera) for NEFilm this month, check it out. Some notes from my experience with the camera are captured in two previous posts: Taking the HVX200 out for a spin, Part 2 (which has links to a short sample movie) and Taking the HVX200 out for a spin, Part 1 (with links to still frames). Clicking on the image will take you to a photo tour of the camera on Flickr. I own a DVX-100 – I love it, but the zoom has always been a problem. How is the zoom on the HVX-200? 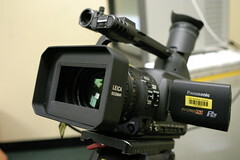 The zoom on the HVX200 is very similar to the one on the DVX100. You have a choice between direct mechanical control of the lens without any delay unlike the Sony HVR-Z1U. The servo mode is also very similar. The thing you have to remember with both cameras is disable the servo when using the zoom ring manually to avoid stressing, and eventually damaging, the gears. One disabled, the manual zoom is very smooth.